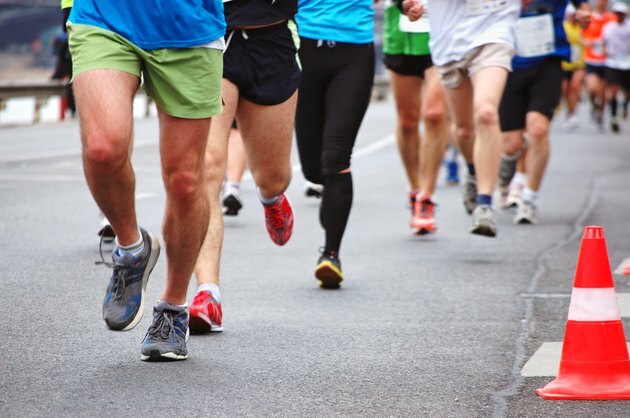 The legs may be an athlete’s greatest asset. When combined with the abdominal musculature, these core muscles create the engine used for most sport movements. As a result, athletes are constantly searching for more effective ways to build and strengthen their leg muscles. The combination of a balanced diet, rest and a progressive scientific weight training regimen that targets the lower body is the quickest route to stronger and more powerful leg muscles. The following foods are great components of a diet meant to build the body's lower half. However, no food contributes solely to muscle development in the lower body. The legs grow larger in comparison to other parts only when training is focused on the lower extremities. Standard nutritional adages apply when choosing foods to allow the body to build stronger and more powerful leg muscles. According to the National Strength and Conditioning Association, protein is essential and should be supplied in every meal (around 1.5 to 2.0g/kg of body weight is ideal). Carbohydrates should remain the predominant macronutrient; complex carbs are preferred over simple carbs but both are needed. Fat should be used in moderation, totaling about 30 percent of your overall diet. Monounsaturated and polyunsaturated fats should make up most of the fat allotment. In order for the body to build muscle, athletes also must exceed their caloric requirements by about 10 percent. The following meals are examples of meals that build leg muscle when combined with rest and a lower body training regimen. 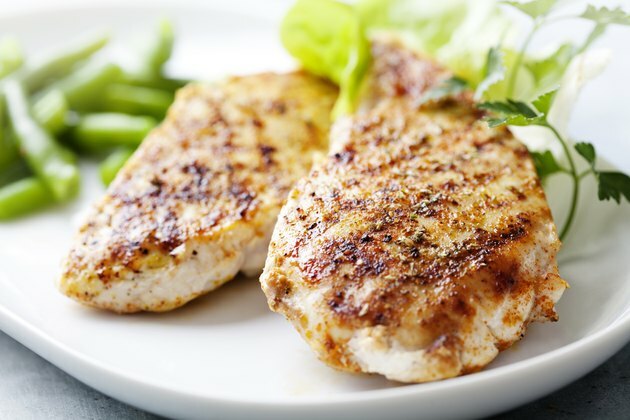 Lean white chicken breast adds protein without the fat of dark meat. Salad greens and mixed colored vegetables provide antioxidants to help the body recover from training sessions. Olive oil and avocado provide heart-healthy fats when portioned appropriately. Like many fish, salmon packs protein. 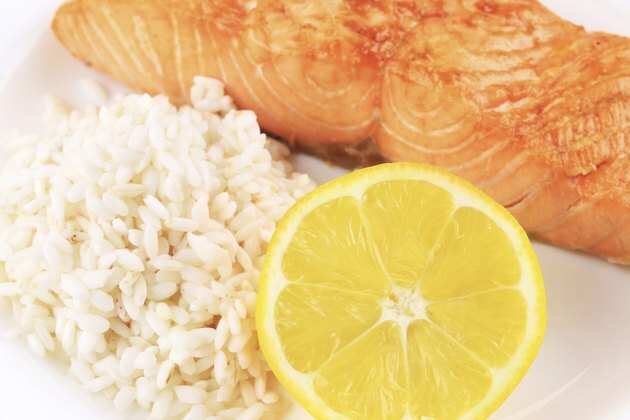 It also contains omega-3 and omega-6 polyunsaturated fats. Brown rice and vegetables provide the carbohydrates needed to sustain energy throughout training and antioxidants to recover. 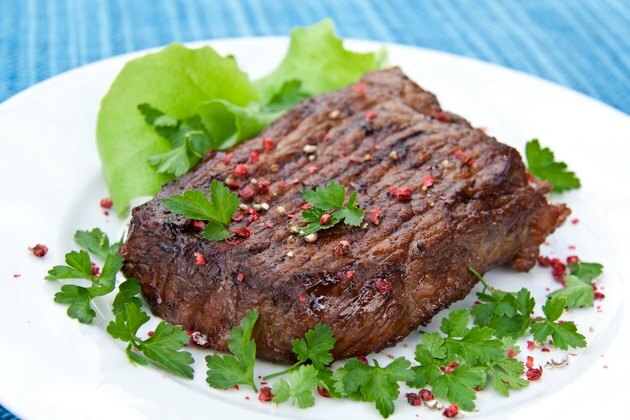 Bison provides twice the protein of regular beef with half the fat. Yams and vegetables provide energy for training and antioxidants for recovery. 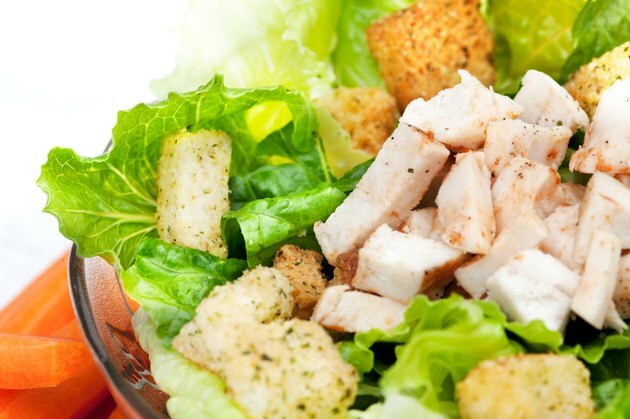 Turkey and chicken are low in fat and high in protein. Swiss cheese is lower in fat and can be added for flavor. Whole wheat bread, pretzels and bananas fuel workouts. 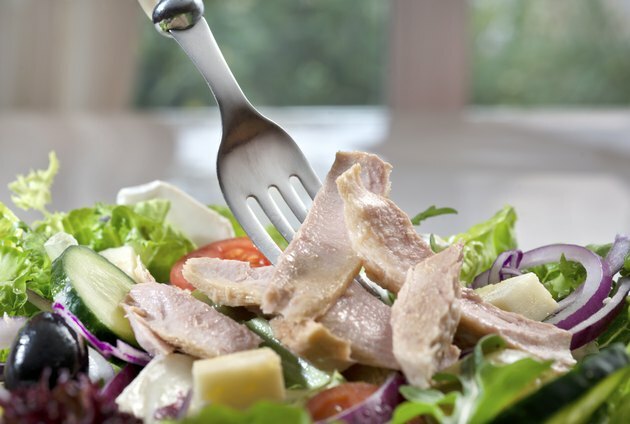 Tuna salad is a great source of protein that can be made healthy by limiting the amount of mayonnaise in the recipe. It should be dry. 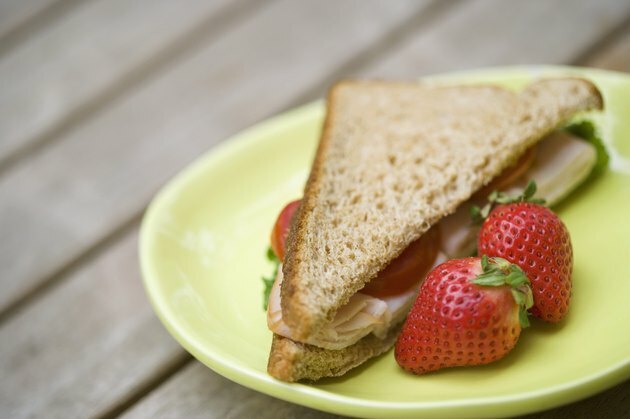 Complex carbs are provided via whole wheat bread. Carrots and apples are good sources of antioxidants, vitamins and minerals needed for recovery. 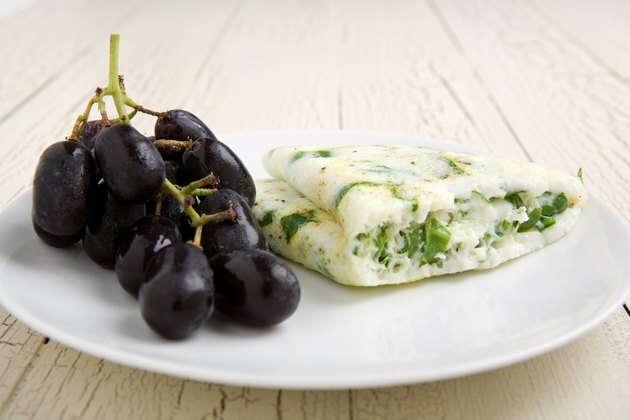 Egg whites are full of protein, and combined with vegetables sautéed in olive oil they provide good sources of fat and carbs. Oranges provide vitamin C for recovery. 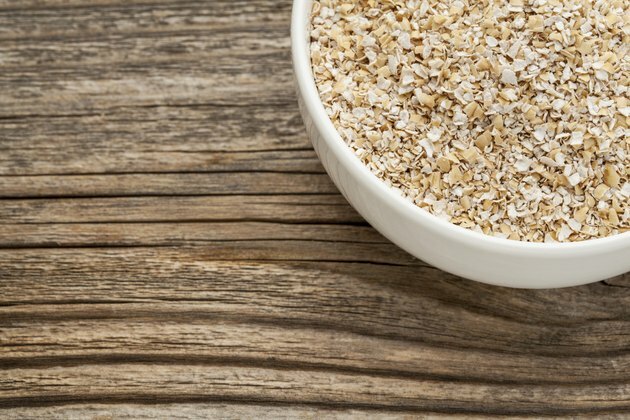 Bran provides complex carbohydrates to power your day. Skim milk provides protein and can be supplemented with the addition of protein powder. Flaxseed can be added to provide heart-healthy fats. Does Working Out the Legs Help Your Body Get Bigger Faster?